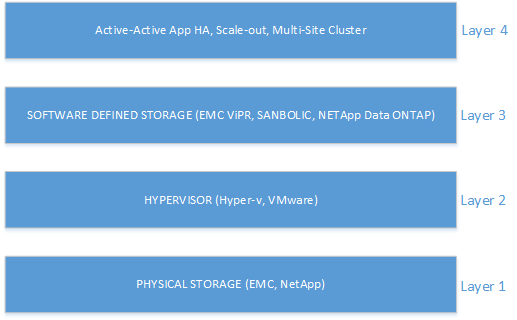 Changed and upgraded functionality of Hyper-v Server 2016. After you upgrade the virtual machine configuration version, you can’t move the virtual machine to a server that runs Windows Server 2012 R2. You can’t downgrade the virtual machine configuration version back from version 6 to version 5. Turn off the virtual machine to upgrade the virtual machine configuration. After the upgrade, the virtual machine will use the new configuration file format. 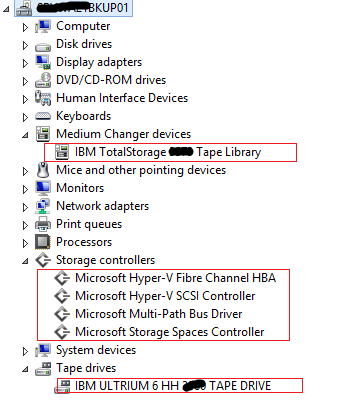 The new configuration files use the .VMCX file extension for virtual machine configuration data and the .VMRS file extension for runtime state data. 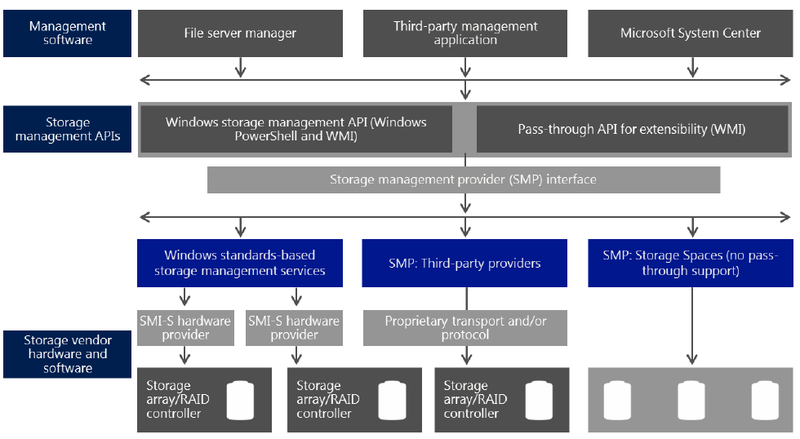 Down-level management of Hyper-v running on Windows Server 2012, Windows 8, Windows Server 2012 R2 and Windows 8.1. 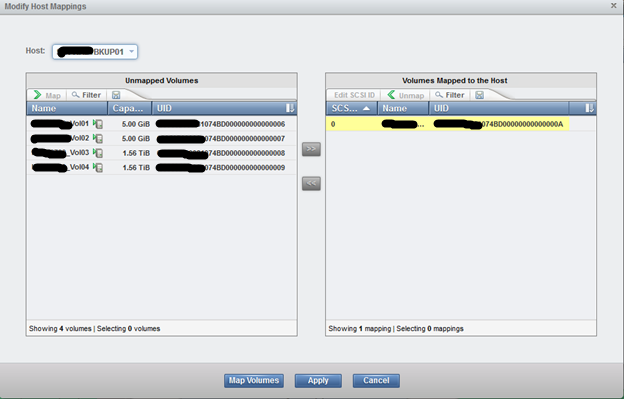 Create a fixed size VHDX on a ReFS volume instantly. 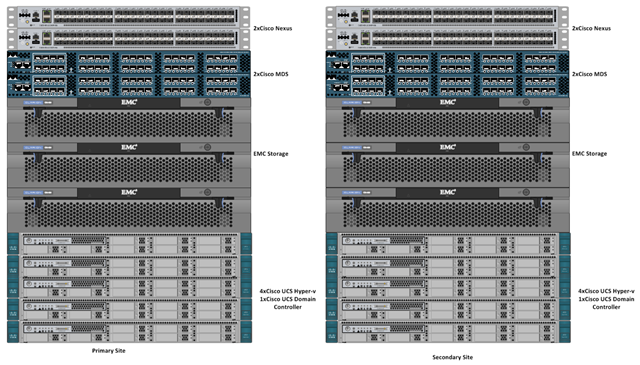 Stretched cluster allows you to configure Hyper-v host and storage in a single stretch cluster, where two nodes share one set of storage and two nodes share another set of storage, then synchronous replication keeps both sets of storage mirrored in the cluster to allow immediate failover. 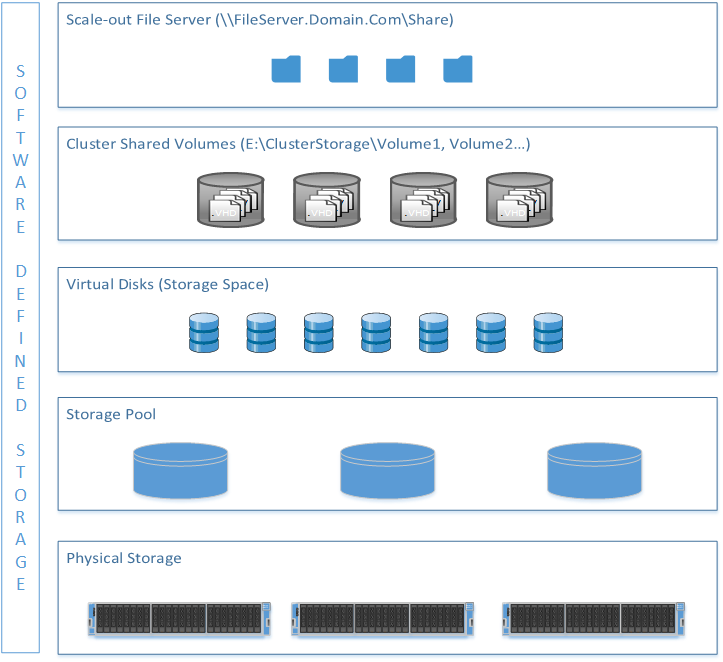 These nodes and their storage should be located in separate physical sites, although it is not required. 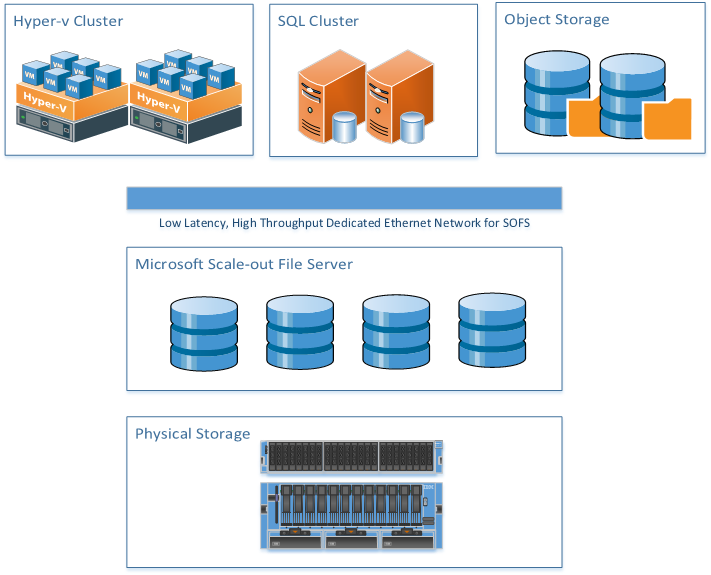 The stretch cluster will run a Hyper-V Compute workload. 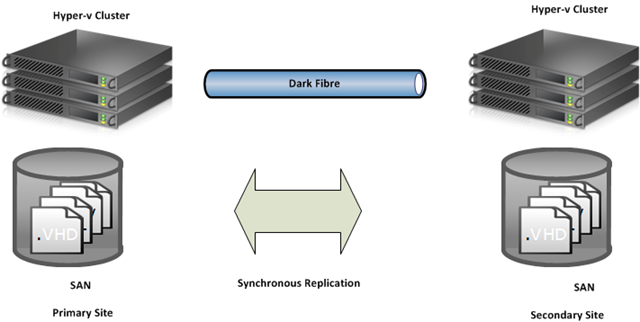 Hyper-V Replica provides IP based asynchronous replication of virtual machines between two Hyper-v servers. Since this an asynchronous replication, replica virtual machine will not have the most recent data. However, replica virtual machines provides a cost effective way of keeping a copy of production virtual machines in a secondary site and can be made available in case of a disaster. 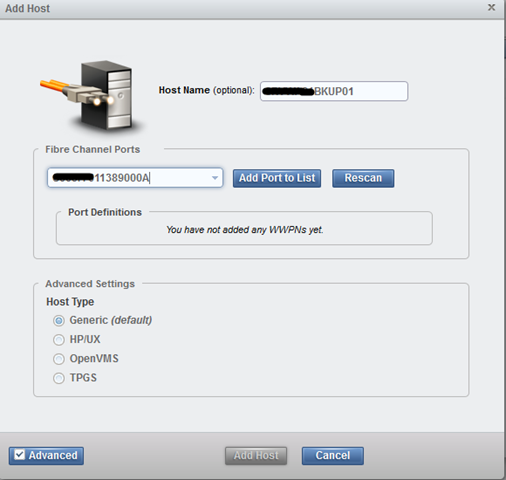 Similar virtual network and physical network must be configured in secondary site for replica virtual machine to function as production virtual machine. 2. Open Windows Firewall with Advance Security and click Inbound Rules. 3. Right-click Hyper-V Replica HTTP Listener (TCP-In) and click Enable Rule. 4. Right-click Hyper-V Replica HTTPS Listener (TCP-In) and click Enable Rule. 2. Right Click on HVReplica Computer Object>Properties>Security Tab>Hyper-v Cluster Nodes NetBIOS Name>Allow Full Permission>Apply>Ok. 1. Log on Hyper-v Host>open Failover Cluster Manager. 3. 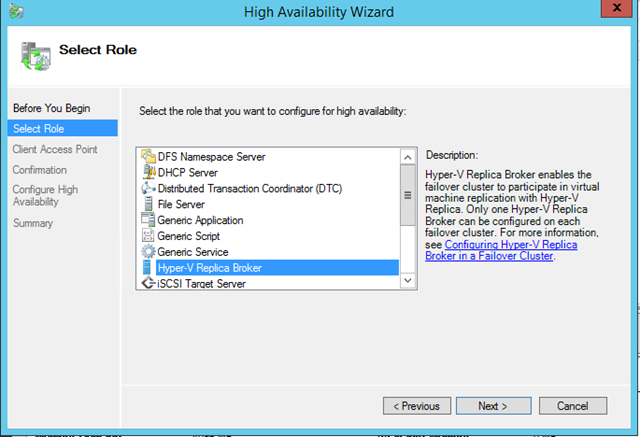 In the Select Role screen, select Hyper-V Replica Broker. 4. 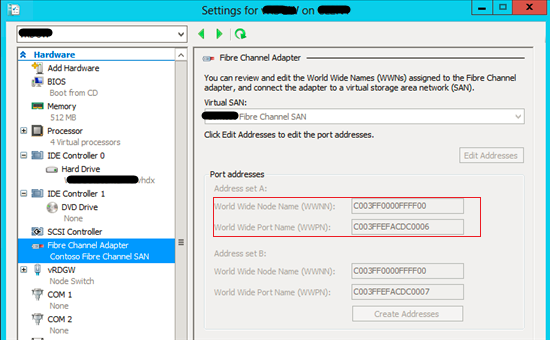 Complete the wizard, providing a NetBIOS name you have created in previous step and IP address to be used as the connection point to the cluster. 5. 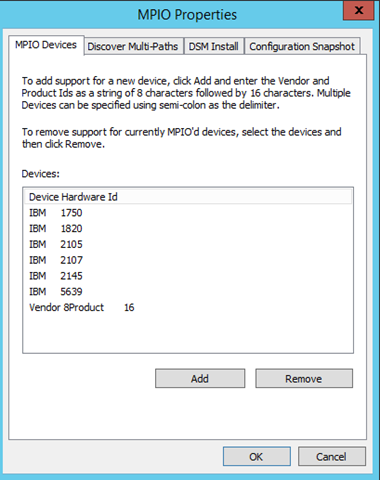 Verify that the Hyper-V Replica Broker role comes online successfully. Click Finish. 6. 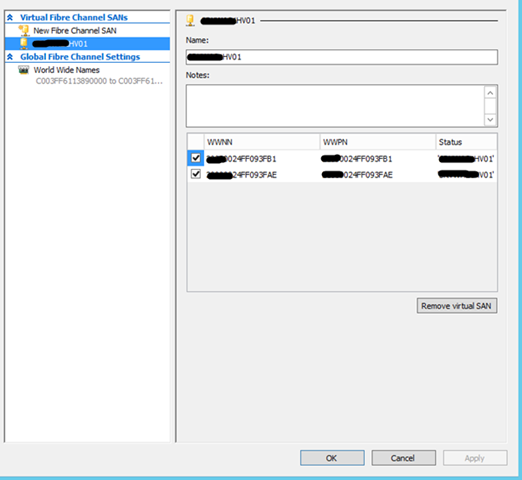 To test Replica broker failover, right-click the role, point to Move, and then click Select Node. Then, select a node, and then click OK.
8. Right-click the role and choose Replication Settings. 9. 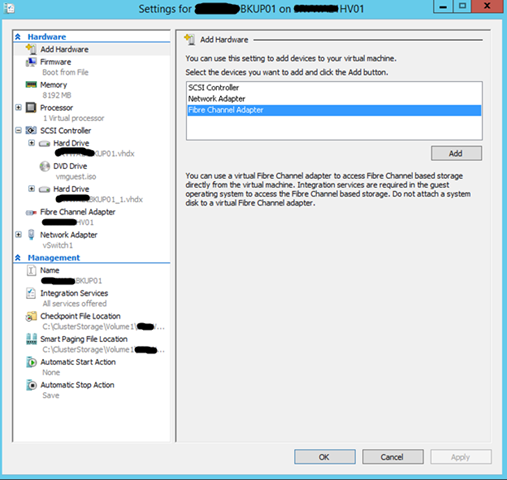 In the Details pane, select Enable this cluster as a Replica server. 10. In the Authentication and ports section, select the authentication method Kerberos over HTTP and authentication over HTTPS. 11. To use certificate-based authentication, click Select Certificate and provide the request certificate information. 12. In the Authorization and storage section, you can specify default location or specific server with specific storage with the Trust Group tag. 13. Click OK or Apply when you are finished. 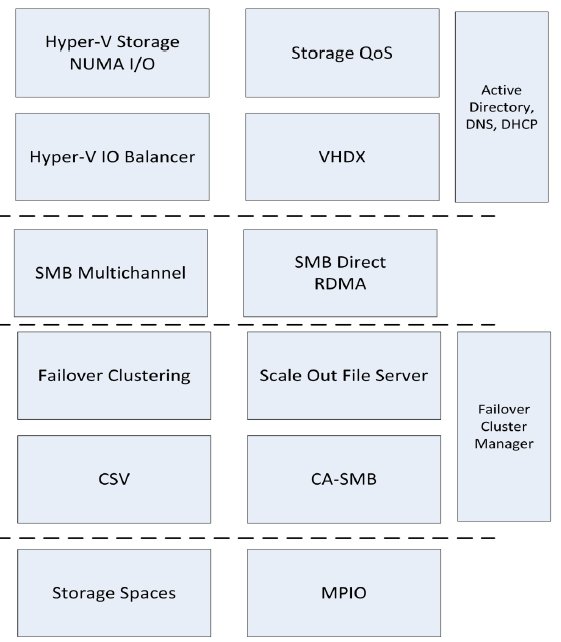 To Configure Hyper-v replica Broker in non-clustered environment. 1. 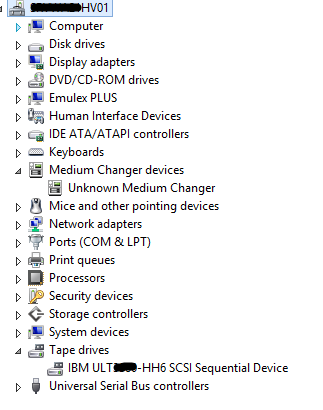 In Hyper-V Manager, click Hyper-V Settings in the Actions pane. 2. 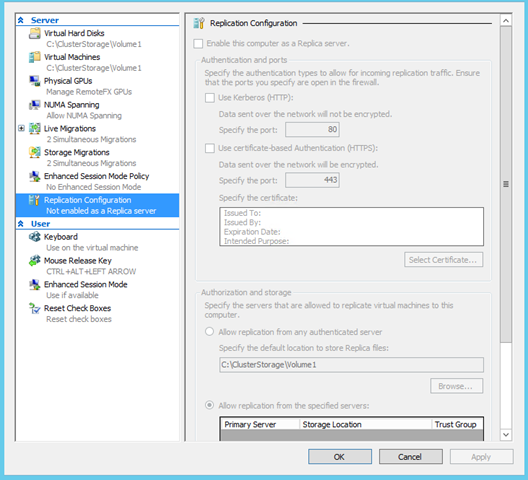 In the Hyper-V Settings dialog, click Replication Configuration. 3. In the Details pane, select Enable this computer as a Replica server. 4. In the Authentication and ports section, select the authentication method Kerberos over HTTP and authentication over HTTPS. 5. To use certificate-based authentication, click Select Certificate and provide the request certificate information. 6. In the Authorization and storage section, you can specify default location or specific server with specific storage with the Trust Group tag. 7. Click OK or Apply when you are finished. 1. 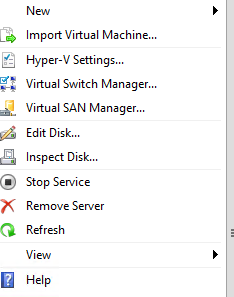 In the Details pane of Hyper-V Manager, select a virtual machine by clicking it. 2. Right-click the selected virtual machine and point to Enable Replication. The Enable Replication wizard opens. 3. On the Specify Replica Server page, in the Replica Server box, enter either the NetBIOS or fully qualified international domain name (FQIDN) of the Replica server that you configured in Step 2.1. If the Replica server is part of a failover cluster, enter the name of the Hyper-V Replica Broker that you configured in Step 1.4. Click Next. 4. On the Specify Connection Parameters page, the authentication and port settings you configured for the Replica server in Step 2.1 will automatically be populated, provided that Remote WMI is enabled. If it is not enabled, you will have to provide the values. Click Next. 5. On the Choose Replication VHDs page, clear the checkboxes for any VHDs that you want to exclude from replication, then click Next. 6. On the Configure Recovery History page, select the number and types of recovery points to be created on the Replica server, then click Next. 7. On the Choose Initial Replication page, select the initial replication method and then click Next. 8. On the Completing the Enable Replication Relationship Wizard page, review the information in the Summary and then click Finish. 9. A Replica virtual machine is created on the Replica server. If you elected to send the initial copy over the network, the transmission begins either immediately or at the time you configured. 1. In Hyper-V Manager, right-click the virtual machine you want to test failover for, point to Replication…, and then point to Test Failover…. 1. 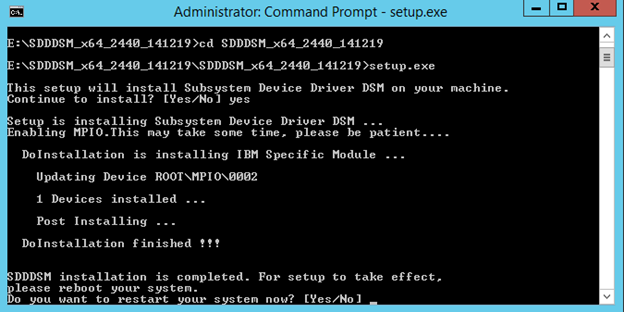 Start Hyper-V Manager on the primary server and choose a virtual machine to fail over. Turn off the virtual machine that you want to fail over. 2. 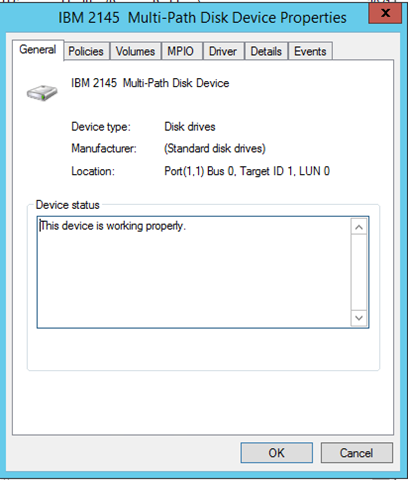 Right-click the virtual machine, point to Replication, and then point to Planned Failover. 3. Click Fail Over to actually transfer operations to the virtual machine on the Replica server. Failover will not occur if the prerequisites have not been met. 1. Open Hyper-V Manager and connect to the Replica server. 2. Right-click the name of the virtual machine you want to use, point to Replication, and then point to Failover…. 4. Use the Complete-VMFailover Windows PowerShell cmdlet below to complete failover. 2. Right-click the name of the virtual machine you want to reverse replicate, point to Replication, and then point to Reverse replication…. The Reverse Replication wizard opens.